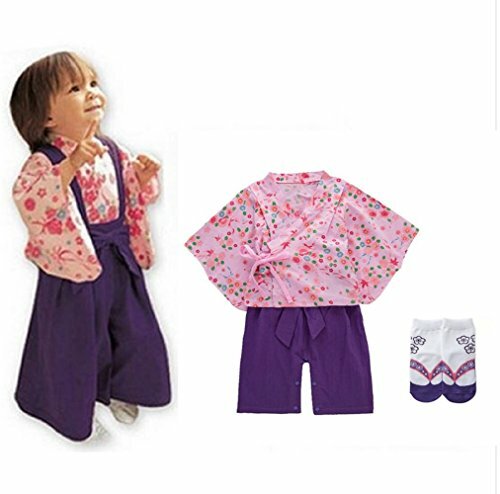 It is a cute baby's traditional Japanese garment costume. For both boys and girls Japanese style socks are set and it is ideal for gifts. Washing: Weak water stream of washing machine or weak hand wash possible ※ Water temperature is limited to 30 degrees, and when using washing machine, net use and hand washing course recommendation. ★ Size: It's very cute pattern, we have a variety of patterns, size available. Please choose the size from the variation. ※Depending on the environment of the personal computer, the color looks may look brighter than the actual product. *Product is all New. *Our shop is in Japan. 100% baby friendly premium soft cotton, safety tested for peace of mind. This bright candy color and well-designed printed pattern will let your baby looks more cuter and alive! Suitable for Pageant, Party, Wedding, Birthday or Other Special Occasions.Makes A GREAT GIFT for your little one or for someone special. If you have any questions about this product by SakuraZen, contact us by completing and submitting the form below. If you are looking for a specif part number, please include it with your message.